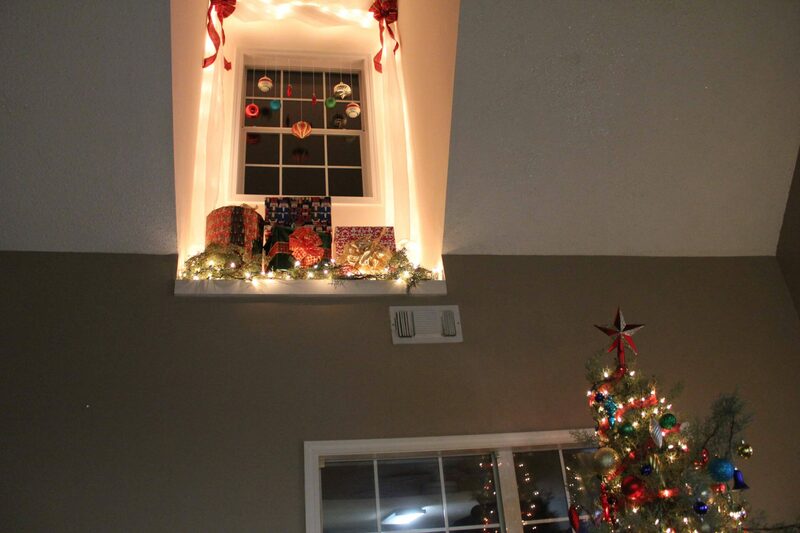 Decorating on the Cheap: Christmas!!!! I love Christmas…I mean, I ADORE IT!!!! I love celebrating the birth of my Savior and I love all the shimmer, bling, tinsel and lights that come with it. 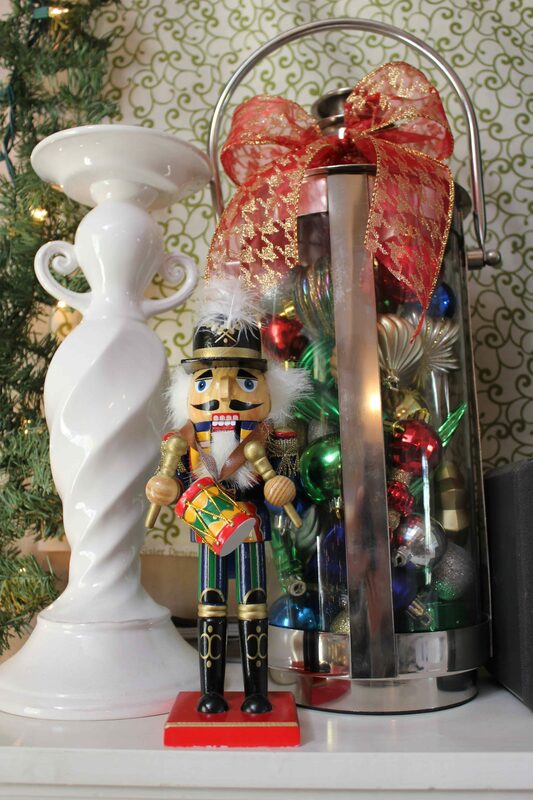 I could spend a fortune on Christmas decor…if I had it to spend. My heart comes alive just walking up and down the aisles of the Christmas section in stores. There is something about all of the colors and the sparkle and shine that sends me back to childhood when Christmas was still magical. It is, in my humble opinion, a little glimpse, a little foreshadowing of the glory of heaven. All the transcendent beauty associated with this season is a little peak into the eternal. #1.) Lights, lights…and more lights!!! !–If you can’t afford to do anything else to prepare your home for this season, just drape Christmas lights over anything that doesn’t move. 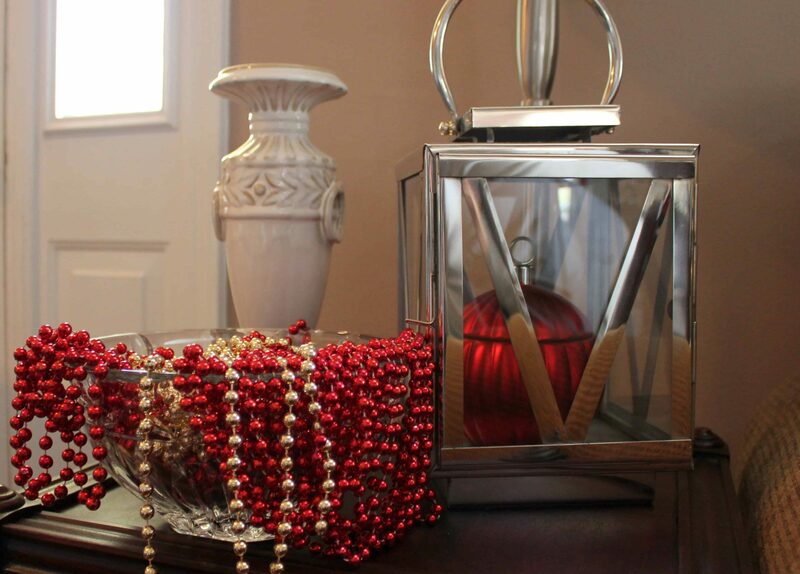 It is absolutely the most cost effective and impactful way to create a magical glow in your home. The soft glow of Christmas lights provides the most magical effect. You can get them anywhere and almost all stores put them on sale at some point. Buy low and stock up! #2.) Ribbon! I bought 50 yards of the most stunning ribbon for $6 the other day. Ribbon can be draped, you can use it as garland, you can make big, lovely bows…the possibilities are endless. Think about the cost per linear foot and the options you have…that is a lot of bang for your buck! I will also be posting a tutorial to show you how to make a really lovely bow that can be used to top your tree, add to garland or to add that finishing touch to your packages. #3.) Wrapping Paper! There are so many possibilities with wrapping paper, beyond wrapping presents. 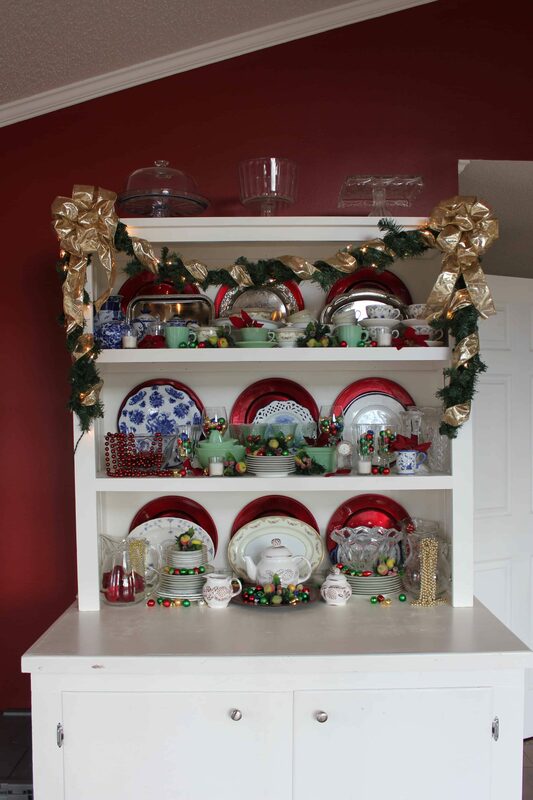 Use it to line the back of shelves for a seasonal change and festive impact. Place a lovely wrapping paper into a frame and mount it on the wall. Use it as a table runner. Wrap your front door. Again, lots of possibilities, lots of square footage, for not a lot of money. I have a kind of unique (aka awkward) feature in my living room. It’s a window with a little landing in front that is about 15 feet up. Since we moved in about a year ago, it has been a real head scratcher trying to figure out what to do with it, but I knew that I wanted to do something cool with it for Christmas. I needed something big and sculptural, but I had like no money to go buy anything, so I just wrapped a bunch of empty boxes, put some bows on them, added lights and a few ornaments and voila! The magic of Christmas! #4.) Beads! 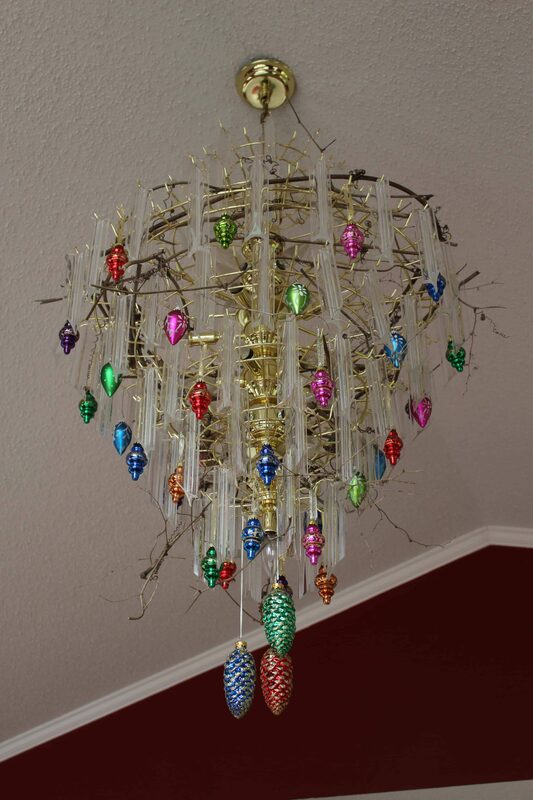 I like to use beads as garland on my tree, but it is always such a pain in hiney to try and unravel them…I nearly lost my mind one year so I decided from that point on, I would throw the tangled mass into a bowl, drape some over the side and call it a day…and it is stunning! #5.) Garland! Ok, so if I had my way, I would drape garland from every corner, on every surface of my home. I love it so much, but it is kind of pricey. I actually bought some cheap ones, but they look…cheap, you know? However, even the cheap ones can look good if used properly. I piled them on top of my armoire (which serves as my pantry) and my china cabinet. They’re up high, so it’s not like it’s in your face. You see less of the cheaper material and more of the evergreen colors and texture. Dress them up with more beads, Christmas ornaments, or even pine cones Of course, if you have it in your budget, go for the more authentic looking ones and just catch them on sale. If you are really ambitious and have some evergreens in your back yard, you could make your own. Of course, the best time to buy any Christmas decor is actually right after Christmas when it is usually marked way down as the stores are trying to get rid of it. #7.) Ornaments! Even the cheapest Christmas ornaments from your local dollar store can be beautiful. My philosophy on ornaments has always been more is more. I love to load down my tree and I feel like abundance is always a good idea at Christmas. The trick is to cover that tree with a ton of your cheaper ornaments, then add a few key, nicer ones in prominent places so that they are the featured pop of color, sparkle and bling on your tree. The other trick to keep in mind with cheap(ish) ornaments is that you can always place them in a bowl and it makes a really lovely vignette. You can also string them up in a window like little pieces of jewelry…lovely! #8.) Nature! Take advantage of God’s free gifts of natural elements…sticks, pine cones, ivy, even rocks can be painted with festive scenes…and if you have all this available to you in your back yard, it’s free! #9.) Make an Ugly Duckling a Swan! I have a really ugly light fixture in my dining room…it’s really just not my taste, but I decided to give it an overhaul for Christmas. 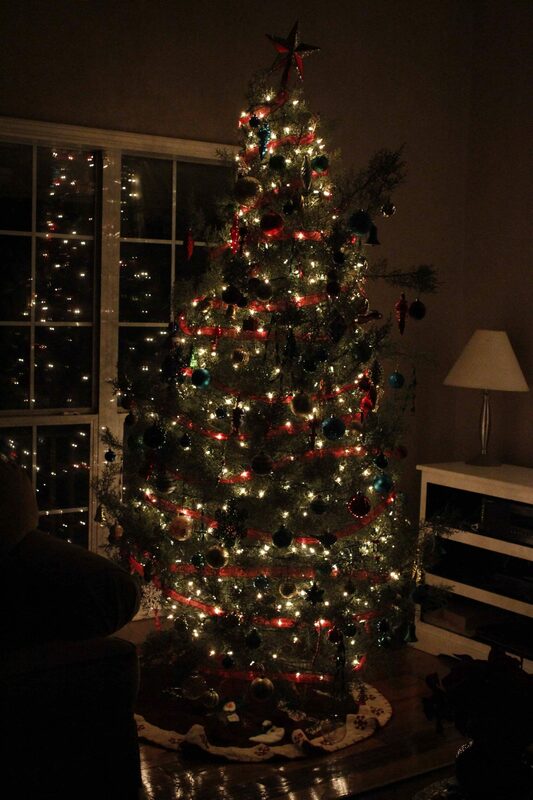 It looks like an up-side-down Christmas tree anyway, so that is exactly how I treated it. I really like how it turned out. Another ugly duckling transformation I was able to pull off was with some pretty sad looking silk flowers. Several years ago I bought some poinsettias from a dollar store and after years of being stuffed in a storage bin, they were looking pretty pathetic. I had to perform a little surgery on them by removing the flowers from the stems and then placed them in clear glass containers. It really gave them new life and purpose and they look FAB. #10.) Work with what you have! 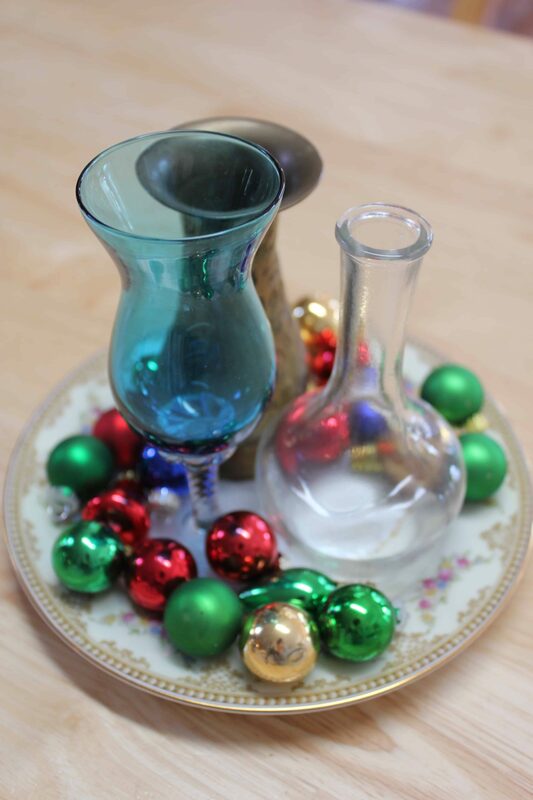 Use pitchers, serving bowls and trays, break out your china and display it in a festive manner dressed up with Christmas trimmings. Remember, more is more. If you have any dishes or stuff from your wedding packed away collecting dust, bring it out and use it! Shanny, this is wonderful! Very, VERY inspiring! Your house looks amazing! You have got the touch, girl friend. Love you! I missed this one in December! I wanta see the pictures BIG guh! 🙂 Keep up the good work!